If you were lucky enough to either preorder Alien Invasion or you have been even more lucky and won a Pet Leet key from Funcom. You will need to know where to head to go and pick up your pet! You can also use paid points and veteran points to buy your pet leet. Including now a Spooky Leet available Halloween 2008 from Veteran Points vendors, the Phasefront stand or form Uncle Pumpkinhead (potential limited availability just to the end of Halloween 2008?)! 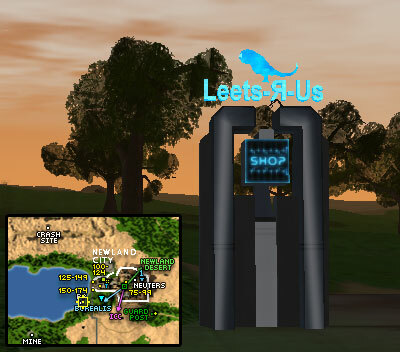 Your pet can be purchased from a terminal like this at 1070 x 430 in Newland to the right of the Bronto Burger Stand. The nano requires you to have at least 61 PsychoModifications and 61 SensoryImprovement. Once you have uploaded your leet pet nano, you will randomly get one of the leets shown in the picture below! There are nanos available in the terminal which will enhance the skills of your pet, why not have a look to see if your pet could use some empowerment. Have fun, and rememeber, "a leet is for life and not just for Christmas!"